"Personalized Mother's Birthstone Name Ring Flush Setting Silver, Triple intertwining bands"
This unique mothers ring with names, dates, words or phrases plus a flush set stone on each band will become a family treasure. It is a beautiful reminder of what is important in life. 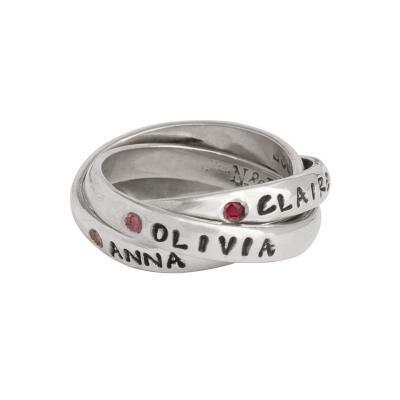 Everytime you look at this personalized birthstone name ring on your finger you will think of the joy in your life. The three interconnecting bands will hold the names and birthstones of three of the most special people in your life. Or you can put nicknames, dates, words or phrases. The bands move around on your finger when worn, so the customization on each band will show at different times. This ring is a continually changing work of art. Personalize with the names of three kids for the mother of three, put the names and birthstones of Mom, Dad and Baby for the mother of one. Personalize with the word LOVE with the anniversary date and couples names and birthstones for a wonderful anniversary or wedding gift. Ring is made of sterling silver and band width is approx 3mm. 2mm stones represent the colors of each month and are flush set by hand so each setting may vary slightly. All prices include stamping of up to 12 characters per band and the stone settings. We do not offer stamping on the inside of the bands. All sales are final. When putting on a triple ring, you must first line up all the names in the correct orientation then roll the ring down your finger. A flipped band will make the ring a whole size smaller. Do not force a ring onto your finger. Please note that the rings are intertwined and move individually. The same name will not always be on top because of the movement. Sizing: Please tell us the size that is a snug but comfortable fit for the finger you will wear the ring. Since birthstone rings cannot be resized we HIGHLY recommend you determine your size before ordering. You can either go to a jeweler or select the ring sizing option in the dropdown menu and we will send you a ring sizer with instructions on how to email us your size.